You are here: Home / Latest News / The Great Wheelbarrow Dash! 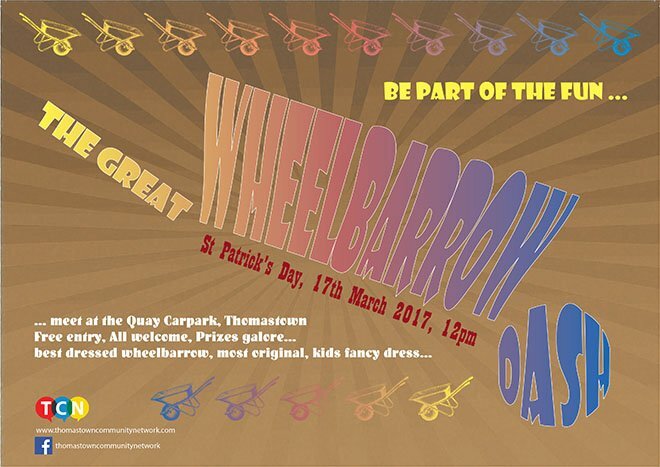 There’s some great fun in store on St Patrick’s Day this year, as Thomastown Community Network is arranging the town’s first great Wheelbarrow Dash. All are welcome to decorate a wheelbarrow in any manner they like, and in any theme, and then meet at The Quay car park at 12 noon that day to take part in the dash along local streets. Fancy dress is encouraged, and there really is plenty of scope for what your entry can be. Members of local sports clubs could paint a wheelbarrow in their team colours…businesses could use the opportunity to promote themselves…or you could even paint a barrow white (like The White House) and then push around somebody dressed as Donald Trump! Entry is free, and there will be prizes galore on the day, such as best dressed wheelbarrow, most original idea, children’s fancy dress, and more. It’s going to be great…so get thinking about decorating a wheelbarrow now!